When you are coming to see an attorney, it is often a trying and stressful time in your life. At The Orlow Firm, we understand that intimately. 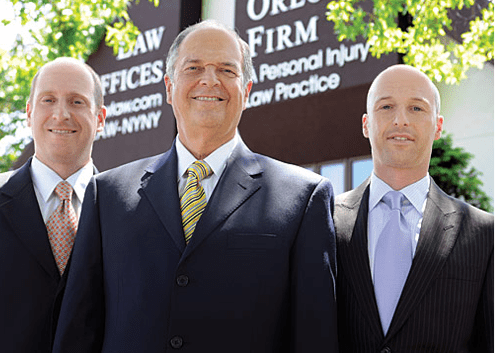 Our goal is to serve all of our clients personally and compassionately and meet their needs after a traumatic incident by obtaining all compensation to which they may be entitled. Our firm’s significant verdicts and settlements show how we have helped many injured victims throughout New York City. You will see that we are dedicated to victims’ rights, justice and recovery. Our success is marked by more than numbers. Our client testimonials show the dignity, care and passion that we bring to helping our clients overcome serious injuries and accidents caused by the negligence or carelessness of others. $800,000 for a women who slipped and fell in front of her apartment due to water leaking from the roof of the building. She injured her neck and back which required surgery. $675,000 for an oil repairman who slipped on ice at a school while there to repair a boiler. He injured his knee which required surgery. $325,000 for a woman who was exiting her building when she tripped and fell due to a cracked step. She fractured her ankle and required surgery. $300,000 for a client who was at a long term parking lot to drop off her car when she slipped and fell on ice that was poorly shoveled. She fractured her ankle which required surgery to correct. $260,000 for a man who fell down on defective and poorly lit steps while exiting his job. He fractured his ankle and required surgery. $250,000 for a woman who tripped and fell while walking on a sidewalk. The sidewalk, which was in front of an apartment building, was raised. She required two surgeries for her injured knee. $240,000 for a home health aid who was walking down the steps in a building where she worked when she tripped on a defective step causing her to fall. She sustained a fractured ankle that required surgery. $187,000 for a letter carrier who tripped and fell on the front steps of a house while he was delivering mail. He hurt his shoulder and required surgery. $175,000 for a woman who slipped and fell in a funeral home due to a defective curtain. She fractured her ankle and required surgery. $125,000 for a man who slipped and fell while walking on the sidewalk outside a house. He required surgery for a fractured wrist. $900,000 for a woman who was sexually assaulted by the superintendent of the building where she lived. $425,000 for a minor who was sexually assaulted by a hotel staff member. $325,000 for a woman who was raped while entering a New York City Housing Authority building to go to work. $250,000 for a NYC high school student slashed in the face by another student while leaving her classroom. She had numerous stitches to her face that left with a permanent scar. $150,000 for a woman who was assaulted at her job due to a lack of security. Her shoulder injury required surgery. $5,000,000 for an infant who was placed in a foster home that contained lead paint. Infant was diagnosed with extremely elevated levels of lead in his blood causing neurological problems. $450,000 for an infant who was placed in a foster home that contained lead paint. Infant was diagnosed with elevated levels of lead in his blood causing neurological problems. $125,000 for an infant who had elevated levels of lead in his blood. We were able to settle the case even though the defendant was uninsured. $110,000 for an infant who had elevated levels of lead in her blood. We were able to settle the case even though the defendant was uninsured. $225,000 – A city employee was walking when she tripped and fell on a raised sidewalk between two homes. She fractured her wrist and required surgery to repair. $125,000 – Female walking on a sidewalk outside a NYC park that had not been shoveled for weeks when she slipped and fell on ice. She fracture her nose and injured her knee. $100,000 – A bus driver walking to work tripped and fell on an uneven sidewalk. She hurt her wrist and underwent surgery to correct it. $900,000 for an undocumented delivery man who was injured when bricks from the facade of the building where he worked, fell off and struck his head and shoulder. He injured his neck which required surgery. $690,000 for a resident of a building who tripped and fell due to a broken step in the building. He injured his back and required surgery. $425,000 – Maintenance worker at a NYCHA building slipped and fell on sand leftover by an outside construction company. Worker required two knee surgeries. $200,000 – A custodian slipped and fell while cleaning the bathroom at a university due to a persistent leak from the ceiling. She tore ligaments in her knee which required surgery to repair. $200,000 – Home health aide slipped and fell in the kitchen of the house where she was working. The aide injured her knee requiring surgery. $149,000 – A taxi stand worker at JFK Airport tripped and fell over wires placed there by construction workers. She required surgery for her injured shoulder. $1.6 million for a construction worker injured when he fell down stairs at a construction site while carrying a heavy pale of cement. Plaintiff was walking down a temporary staircase which he claimed was shaking and not properly secured to the ground below and the floor above. He sustained injuries to his back requiring surgery and which prevented him from working. $1.375 million for a construction accident in which a man fell from a scaffold, injuring his back and knee. The settlement was established through mediation. $1.3 million for a construction worker who fell 20’ off a ladder while descending it. He injured his neck and back both of which required surgery. $1.3 million for a painter who fell off a ladder while working at a school. He fractured his heel requiring surgery. $950,000 for a maintenance worker who fell off a ladder while fixing a sign for a restaurant. He fractured his knee requiring surgery. $750,000 for a construction worker injured when debris fell from above and struck him. He sustained torn ligaments in his shoulder, requiring arthroscopic surgery. $600,000 for a construction worker who was injured on the job due to uncleanliness at site. He injured his knee, requiring two surgeries. $400,000 for an undocumented laborer who fell 6’ off a scaffold that collapsed. He injured his ankle and required surgery. $275,000 for a construction worker who was thrown off his truck. His elbow fracture required surgery. $245,000 for a construction worker who was injured when construction material toppled over onto his legs. He required surgery to his knee and ankle. $997,997 for a driver whose taxi was hit head on by a truck. He injured his back which required surgery. $750,000 for a maintenance worker was a passenger in a work vehicle that was involved in an accident with another truck. He required surgery to his neck and surgery to a pre-existing back injury. $650,000 for a passenger on a motorcycle that was struck by a police car. She suffered multiple injuries, including a fractured jaw that required surgery. $650,000 for a women who was a passenger on a bus that was struck by a tractor trailer. She injured her hand and shoulder both of which required surgery. $485,000 for a client who was changing the tire on his vehicle when he was struck by another vehicle. His big toe was badly damaged and needed to be amputated. $435,000 for a driver who was driving straight when another vehicle made a left turn and struck him. The driver required surgery for a fractured ankle and wrist. $325,000 for a woman who was stopped in traffic when a bus reversed into her vehicle. She injured her shoulder and knee, both requiring surgery. $250,000 for an elderly woman who was struck by a vehicle when she was crossing the street. She required surgery for a fractured hip. $230,000 for a client who stopped in her vehicle when she was struck in the rear by a private ambulance. As a result she sustained an injury to her shoulder that required two surgeries. $225,000 for a bicyclist who was struck by rollerblader in Central Park. He fractured his collarbone which required surgery to repair. $215,000 for a home health aid who was on an Access-a- ride van when it was stuck by another vehicle. She injured her shoulder that required her to have surgery and miss a year of work. $205,000 for a passenger in a vehicle that was struck by another vehicle. The passenger sustained a knee injury, which required two surgeries. $200,000 for a woman injured in an auto accident. She sustained an injury to her knee which required surgery. $183,269 for a man who was struck by a motor vehicle while using a crosswalk. He sustained injuries to his back and left knee, the latter of which required surgery. $475,000 for an emotionally disturbed woman who was shot in the face by the NYPD with bean bag gun causing her to lose her eye. Inmates recovery of $400,000 for sexual assaults by a corrections officer in prison. $275,000 for a man who was at his job as a parking garage attendant when he was assaulted and falsely arrested by an NYPD officer. He injured his shoulder, which required surgery. $150,000 for a client who was walking down the street when he was assaulted by police officers. He sustained an injury to his thumb that required surgery. $150,000 for a grandfather who was assaulted at a family gathering by NYPD officers. He injured his knee and required surgery. $2.75 million for siblings who claimed they were neglected, abused and sexually abused in a foster home.